Do you ever feel like you’ve entered an alternate reality when you try to talk with someone in your IT department?You ask a simple question, hoping for a simple answer (but fully expecting a complicated one). Your IT guy (let’s call him IT Kevin), rambles off all these acronyms and words that sound like they’re made up. So you just stand there nodding your head and politely smiling, trying not to make it completely obvious that you have absolutely no idea what IT Kevin is talking about. But, don’t worry—you’ve come to the right place! After reading this, you’ll blow IT Kevin away with your knowledge. This little cheat sheet will get you up to speed on some basic website terminology, so all those made-up-sounding words and acronyms will actually make sense to you. You may even feel brave enough to contribute something to the techy conversation! One person draws a card that has a strange word or acronym on it. The rest of the players hear the word or acronym and either do their best to guess the real definition or think of a fake definition that sounds like it could be the real one. Then they write it down and give it to the player that drew the card. That person reads all the definitions out loud and the group votes for what they think is the real definition. Points are awarded for both guessing the real definition and fooling someone with a fake definition (which is why it’s so fun!). Balderdash Answer: How much space a musical group takes up on stage. Real Definition: Bandwidth refers to how much a resource is used. It helps to think of a highway—the more lanes a highway has, the easier it is for drivers to travel. A highway with only one or two lanes still allows the same number of cars to travel, but it creates more congestion and travel takes longer. Likewise, the more bandwidth a website has, the more visitors can access it and use it easily. If a website does not have a lot of bandwidth, it won’t be able to handle as many visitors. Balderdash Answer: A poker term for the last hand you play before folding your hand. Balderdash Answer: A cross between a Labrador and a Schnauzer. Real Definition: Whenever you go online, you view websites in a browser. Some examples are Internet Explorer, Safari, Firefox, and Google Chrome. Balderdash Answer: A term used by meteorologists, meaning that the clouds are completely covering the sky. Real Definition: When you create a document on your computer, you save it to the hard drive, which is physically located inside your computer. Cloud hosting allows you to create data for a website and then store it in a “cloud.” This means that it is stored on the internet rather than in your computer’s hard drive (so if your computer crashes, you entire website doesn’t crash with it). Balderdash Answer: An acronym for Center for Milk Studies. It’s where all the tests on milk happen. Real definition: CMS is short for Content Management System. A content management system is a way for your website to be easily updated—it gives your team a place to log in and update a few fields with data. With a CMS, you don't have to know how to work with "code" and other mysterious stuff in order to make website updates. Balderdash Answer: An acronym for the Canadian Organization for Dental Education. Real Definition: While my fake answer may actually exist, code is actually a language web designers use to create everything we see online. Balderdash Answer: Creating marketing that will make consumers feel happy. (The Other) Real Definition: A small piece of information that websites store on your computer when you visit them. The next time you visit one of those websites, it uses the information stored previously on a cookie, enabling you to actually get around that website faster and easier. Balderdash Answer: Acronym for Cross-Stitch Specialists—an organization for professional cross-stitchers. Real Definition: CSS stands for Cascading Style Sheets. These sheets define how things like headers and links will look on your web pages. Balderdash Answer: A word kings and emperors used to talk about the territory under their authority. Real Definition: A domain is how your website is identified. For example, our domain is nectafy.com. Technically, your domain is actually a set of unique numbers assigned to you. But, to make it easier for people to access websites, the domain name you choose is assigned to your number. Balderdash Answer: A common position held within an educational institution’s Registrar’s office. Real Definition: Simply put, a domain name registrar is a service that allows you to officially register your desired website domain name so that it is unique to you, and no one else. Balderdash Answer: An acronym meaning Do Not Send, used in the postal service industry. You can request a DNS with your local post office to stop receiving unwanted mail. Real Definition: The domain name system (DNS) is the way that internet domain names are found. Essentially, it tells the internet where to go look for your website. Balderdash Answer: The ads that are displayed on the side of the screen when you view your email. Real Definition: Using email to try to nurture or generate more leads for your website. Balderdash Answer: An abbreviation for Hotmail. Real Definition: HTML stands for HyperText Markup Language. It’s the language used to give text a specific font, color, graphic, and hyperlink effect. Balderdash Answer: Billboard marketing ads that inbound traffic sees as they drive into a city. Real Definition: Inbound marketing is creating and sharing valuable, timely content (like blog posts and ebooks) in order to solve problems for someone who could potentially become your customer, with the intention of generating responses from them. We’re pretty crazy about inbound marketing at Nectafy. For a detailed guide explaining inbound marketing, check out The Beginner’s Guide To Inbound Marketing. Or, if you’re curious to know if inbound marketing techniques actually work, you’ll definitely want to read How Our Company Put HubSpot To The Test. Balderdash Answer: Short for International Party Address. The President of the United States gives this speech to foreign alliances around the same time the State of the Union is given. Real Definition: An Internet Protocol address is a number assigned to any device (like a computer, printer, smart phone, tablet, etc.) that is participating in a computer network that uses the internet. (Have you ever seen something like “22.231.113.64”? Those seemingly random numbers separated by periods are considered to be your IP address.) Anytime you use the internet, the device you are using to access it can be identified through its IP address. Balderdash Answer: In-School Punishment. It’s what schools now issue in place of out-of-school suspensions. Real Definition: ISP stands for Internet Service Provider. ISPs give you access to the internet. Examples are Verizon, Comcast, and AT&T. Balderdash Answer: The font that baristas use to write your order on the side of a coffee cup. Balderdash Answer: A question submitted to a judge. Balderdash Answer: Another term for headphones or earbuds. Real Definition: A plug-in is a kind of code that extends the capabilities of a website. Plug-ins allow you to extend the functionality of a website without the need to redo the core coding. Balderdash Answer: The trading abbreviation for popcorn. Real Definition: PPC stands for Pay Per Click and is used to describe online ads that you place. Instead of paying for the number of times your ad is shown, you pay each time it's clicked. Balderdash Answer: A new kind of technology that can be added to electronic devices. It will enable an item to respond to people’s voice commands or actions. Real Definition: Responsive design means that your website will change how it is formatted in response to the device it's viewed on. So when your site is viewed on a large screen on a desktop computer, it takes advantage of that space and shows things in a specific, wider format. That same site will change its format when viewed on a smartphone or tablet, making it easier for the user to get to what they want. Balderdash Answer: The layout of a construction site. Real Definition: A site map is an index that shows every single page you have on your website. Balderdash Answer: An acronym for Senior Skating License. This is a license that ice-skating instructors must hold in order to legally charge for lessons. Real Definition: SSL stands for Secured Sockets Layer. It’s a security technology that protects information like credit card numbers and social security numbers from being easily stolen from website hackers. It does this by encrypting the data when it is sent. Balderdash Answer: An acronym for the University of Rumford Lake. Real Definition: URL stands for Uniform Resource Locator. Whenever you type in a web address, you are technically entering the URL—the official title that directs the internet to the formal address of a document or website. Balderdash Answer: A child’s 10-minute banishment to “the corner” or to their bedroom. Real Definition: If you try to access a web page or try to open an email and it takes too long, a window may pop-up reading, “The action timed out.” It just means that the internet server chose to abort the task because it was taking too long to carry out. Balderdash Answer: Though commonly used to describe the movement of persons or vehicles, it is also an acronym for Trade Records Analysis of Flora and Fauna in Commerce. Real Definition: Traffic refers to the visitors you have coming to your website. Many visitors means you have "high traffic," and few visitors means "low traffic." 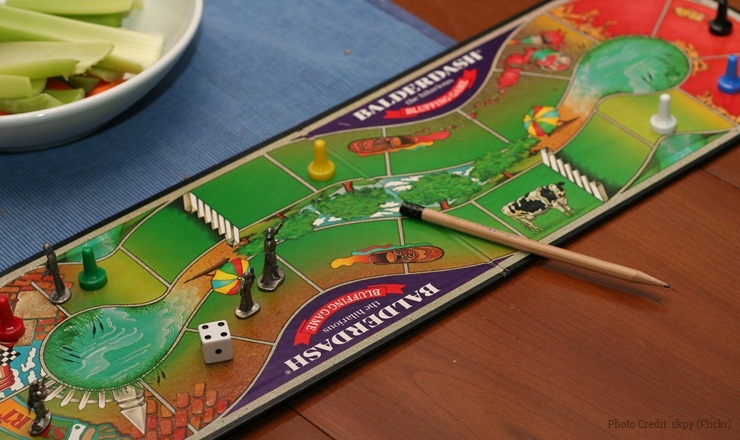 Balderdash Answer: A person responsible for entertaining you whenever you go online. Real Definition: The files for your website have to “live” on a computer. So a web host provides space for everything on your website to be stored. Real Definition: A computer that “serves” web pages when they are searched for. It’s the computer your website lives on. Did we miss any terms? If there’s another term you would have included in this list, let us know in a comment.